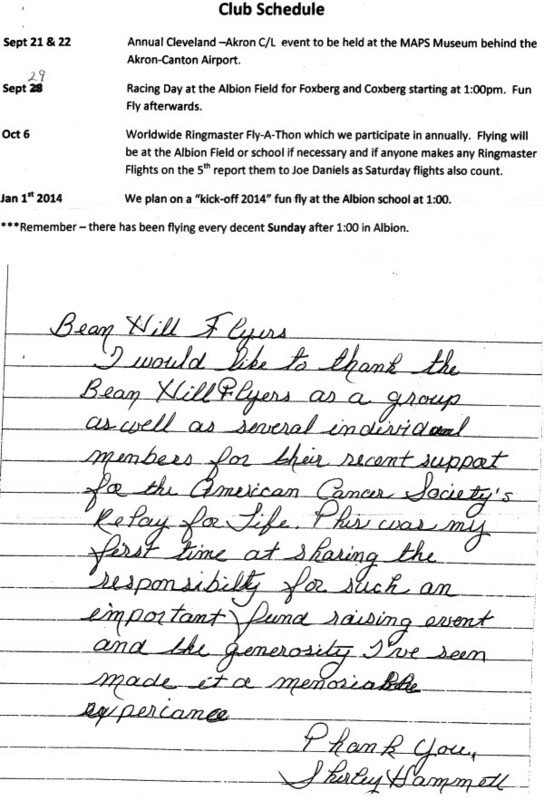 The Bean Hill Flyers club is Erie, Pennsylvania's, only organized control line flying group. 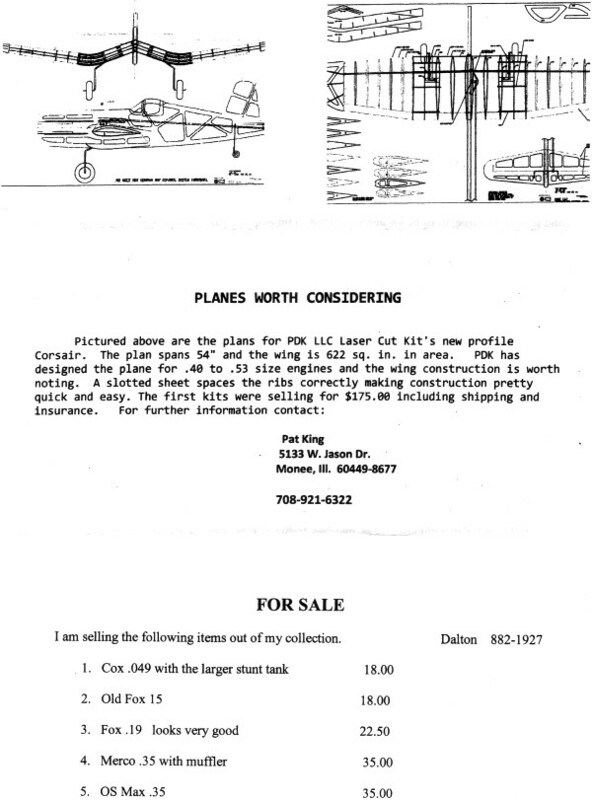 It operates under sanction of the Academy of Model Aeronautics (AMA), charter #4673. 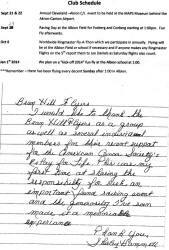 Two main flying sites are maintained, one in Albion, PA, and the other in Millcreek, just west of the Erie city line. 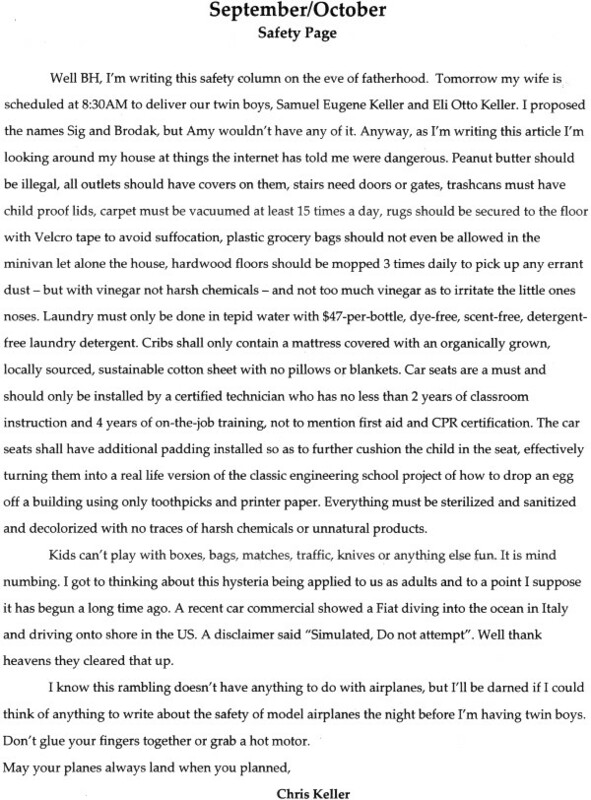 This month's Safety column editor Chris Keller takes a humorous swipe at consumer product safety tips. It's been a busy summer for many of us. Odd weather at times, a bit more rain than usual has kept the grass growing. In spite of this, the weather has been great when we needed it. 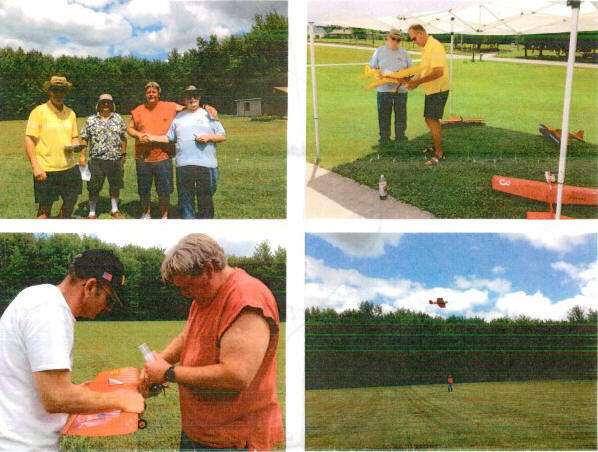 The club fun fly and building contest was great and well attended. Beautiful Cosmic Winds, Busters, and Shoestrings gave the judges a really difficult time choosing the winners. But that's what a building competition is all about. 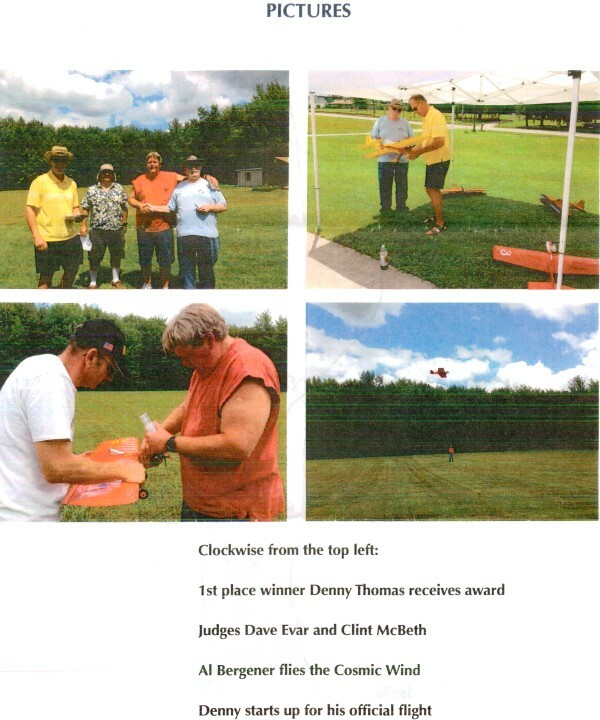 Congratulations to all who participated, and attended, and many thanks to Dave Evar, Clint McBeth and Joe Maxwell. 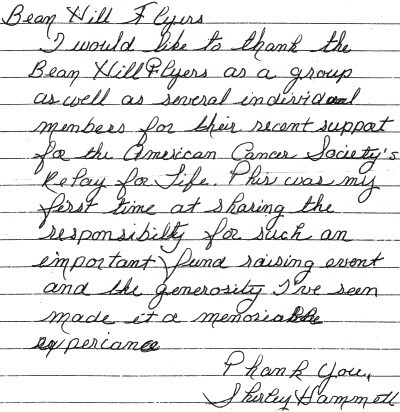 It was a great time for all. In case you weren't there, I can tell you that you missed some really interesting stuff. Such as the fact that George Towns seems to have mastered throttle controlled flying with a standard motor and two lines. Perfect take offs and landings under power. How does he make it do that? And Denny Thomas' Buster has to be the lightest I've ever seen. How does he do it? Balsa Termites? And yes, it is really fast. Anyway, more things for us to aspire to. Flying every Sunday afternoon at the Albion field has taken off this summer! George Towns got the ball rolling and everyone has been enjoying it. From about 1:30 in the afternoon till "whenever" has been the schedule. It's like the old days you remember, wooden airplanes and iron men ....... or is it the other way around? Come join the fun. 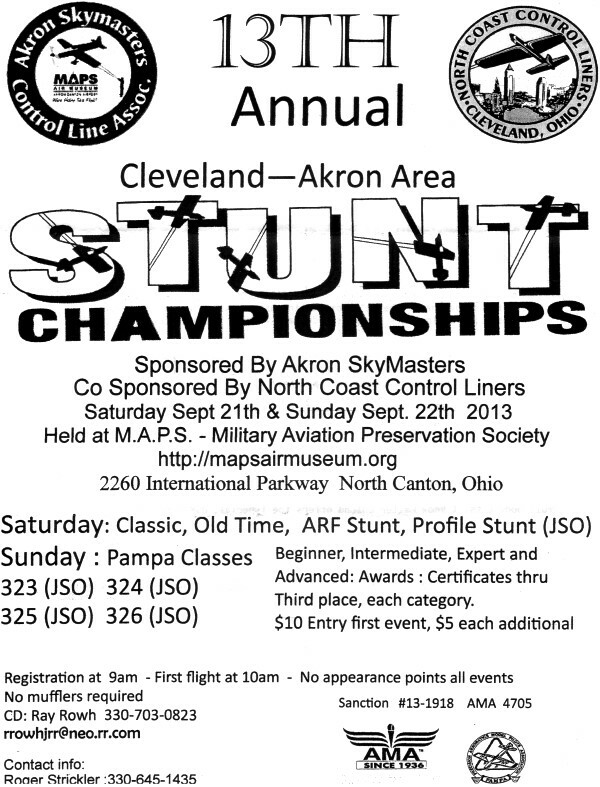 Annual Cleveland-Akron C/L event to be held at the MAPS Museum behind the Akron-Canton Airport. Racing Day at the Albion Field for Foxberg and Coxberg starting at 1:00pm. Fun Fly afterwards. 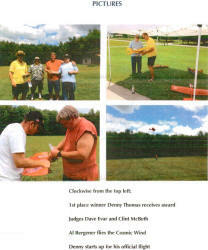 Worldwide Ringmaster Fly-A-Thon which we participate in annually. 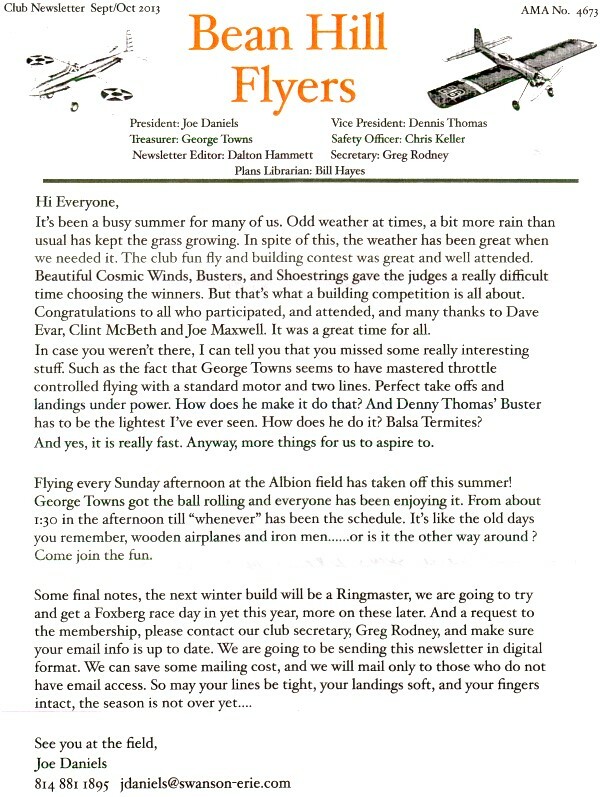 Flying will be at the Albion Field or school if necessary and if anyone makes any Ringmaster Flights on the s" report them to Joe Daniels as Saturday flights also count. We plan on a "kick-off 2014" fun fly at the Albion school at 1:00. 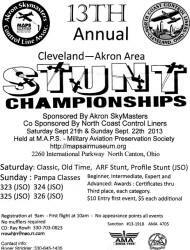 ***Remember - there has been flying every decent Sunday after 1:00 in Albion. Well BH, I'm writing this safety column on the eve of fatherhood. Tomorrow my wife is, scheduled at 8:30AM to deliver our twin boys, Samuel Eugene Keller and Eli Otto Keller. I proposed the names Sig and Brodak, but Amy wouldn't have any of it. Anyway, as I'm writing this article I'm looking around my house at things the internet has told me were dangerous. Peanut butter should be illegal, all outlets should have covers on them, stairs need doors or gates, trashcans must have child proof lids, carpet must be vacuumed at least 15 times a day, rugs should be secured to the floor with Velcro tape to avoid suffocation, plastic grocery bags should not even be allowed in the minivan let alone the house, hardwood floors should be mopped 3 times daily to pick up any errant dust - but with vinegar not harsh chemicals - and not too much vinegar as to irritate the little ones noses. Laundry must only be done in tepid water with $47-per-bottle, dye-free, scent-free, detergent-free laundry detergent. Cribs shall only contain a mattress covered with an organically grown, locally sourced, sustainable cotton sheet with no pillows or blankets. Car seats are a must and should only be installed by a certified technician who has no less than 2 years of classroom instruction and 4 years of on-the-job training, not to mention first aid and CPR certification. The car seats shall have additional padding installed so as to further cushion the child in the seat, effectively turning them into a real life version of the classic engineering school project of how to drop an egg off a building using only toothpicks and printer paper. Everything must be sterilized and sanitized and decolorized with no traces of harsh chemicals or unnatural products. Kids can't play with boxes, bags, matches, traffic, knives or anything else fun. It is mind numbing. I got to thinking about this hysteria being applied to us as adults and to a point I suppose it has begun a long time ago. A recent car commercial showed a Fiat diving into the ocean in Italy and driving onto shore in the US. A disclaimer said "Simulated, Do not attempt". Well thank heavens they cleared that up. 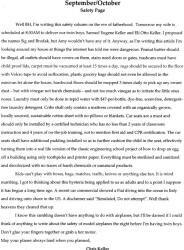 I know this rambling doesn't have anything to do with airplanes, but I'll be darned if I could think of anything to write about the safety of model airplanes the night before I'm having twin boys. Don't glue your fingers together or grab a hot motor. At our annual event we had some very nice building entries in our building challenge. It looks like it is going to have to get a little harder to keep it a challenge - but, don't worry that won't be until next year. The rules are pretty simple. 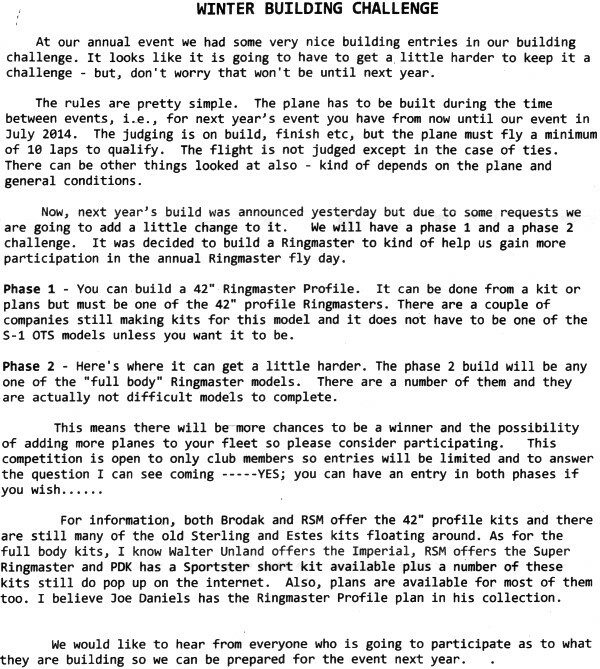 The plane has to be built during the time between events, i.e., for next year's event you have from now until our event in July 2014. The judging is on build, finish etc, but the plane must fly a minimum of 10 laps to qualify, The flight is not judged except in the case of ties. There can be other things looked at also - kind of depends on the plane and general conditions. Now, next year's build was announced yesterday but due to some requests we are going to add a little change to it. We will have a phase 1 and a phase 2 challenge. 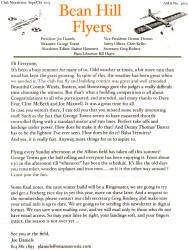 It was decided to build a Ringmaster to kind of help us gain more participation in the annual Ringmaster fly day. 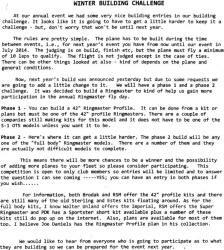 Phase 1 - You can· build a 42"-Ringmaster Profile. It can be done from a kit or plans but must be one of the 42" profile Ringmasters. There are a couple of companies still making kits for this model and it does not have to be one of the S-1 OTS models unless you want it to be. Phase 2 - Here's where it can get a little harder. The phase 2 build will be any one of the "full body" Ringmaster models. There are a number of them and they are actually not difficult models to complete. For information, both Brodak and RSM offer the 42" profile kits and there are still many of the old Sterling and Estes kits floating around. 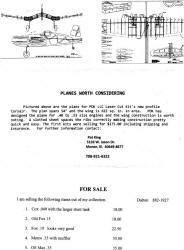 As for the full body kits, I know Walter Unland offers the Imperial, RSM offers the Super Ringmaster and PDK has a Sportster short kit available plus a number of these kits still do pop up on the internet. Also, plans are available for most of them too. I believe Joe Daniels has the Ringmaster Profile plan in his collection. We would like to hear from everyone who is going to participate as to what they are building so we can be prepared for the event next year. Awards: Certificates thru Third place, each category.